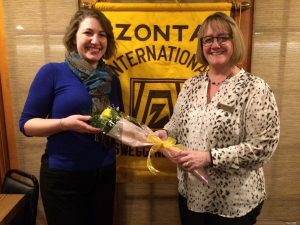 OSWEGO – Zonta Club of Oswego President Tammy Thompson welcomed Mallory Bower as the club’s newest member. Tammy Thompson, right and Mallory Bower. Bower works in Career Services at SUNY Oswego and was inducted at Zonta’s February meeting. The Zonta Club of Oswego is dedicated to advancing the status of women and works locally to raise awareness of issues pertaining to women.